There are cross breeds and cross breeds but how cute is this! Only two months old and much travelled already. 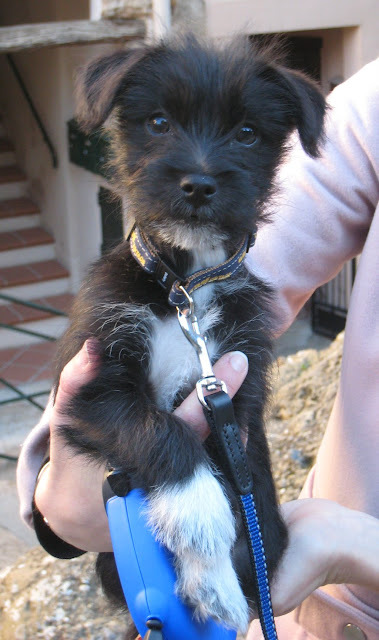 This little bundle of cuteness lives in Majorca, Spain but is here on holiday with his young owners, and visiting the medieval village of Roquebrune. These photographs were taken fairly near to the entrance to the Xth century Chateau. What an inquiring little face! What a cutie! Thanks for posting all the great dog pictures. Too cute - looks like some sort of terrier in there. I think my Pinky must be like this one when he was a puppy. Now he is 16 years and i took him from the street when he was about 1 year old.